I made this last Saturday night after a loooooong week of school. 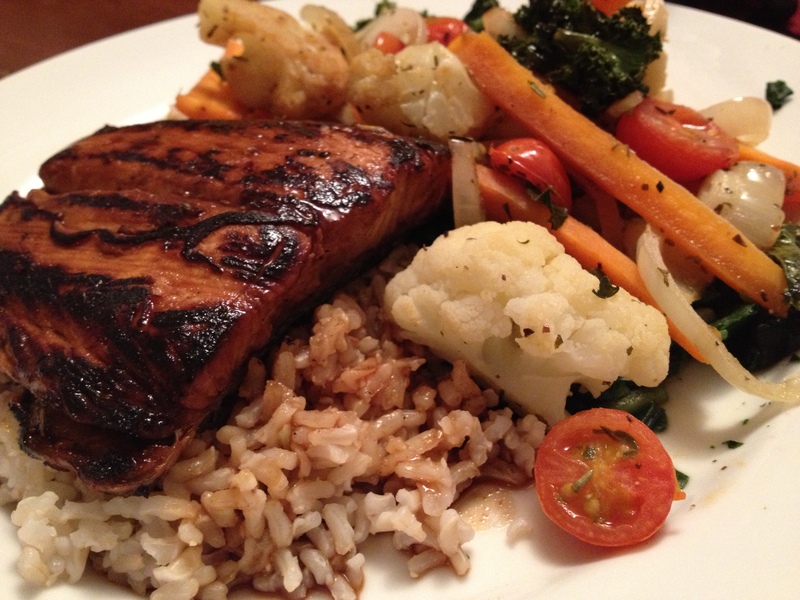 Nothing like some fresh salmon fillets from Whole Foods and some yummy teriyaki-marinated veggies over a bed of brown rice to relax! I adapted this recipe from Skinny Taste, one of my favorite food blogs! Combine the soy sauce, vinegar, and honey in a resealable bag. Add the salmon and mix to coat. Refrigerate for at least 1 hour (or up to 8 hours). Cover and continue to cook for 4-5 minutes on low heat, until salmon is cooked through. Remove salmon from pan and serve over bed of brown rice. Drizzle some of the sauce over the rice and fish.